Pink eye, also called conjunctivitis, is an annoying and quite common condition, but luckily, there are many effective pink eye home remedies to treat it. Pink eye is an eye infection that usually causes a swollen eyelid and a pink, irritated eyeball. The condition is not dangerous, but it can be very irritating and uncomfortable. Some people can even contract pink eye on a reoccurring basis. Children are more likely to get pink eye, but it can affect anyone of any age. If you have pink eye, then you likely want to know how to cure pink eye fast, but it’s important to realize that there are several different types of pink eye, and symptoms may vary depending on which type you have. Bacteria can cause a pink eye infection to develop. This type of pink eye can sometimes result in serious damage if left untreated. Common colds and other viruses can also result in pink eye. Usually, this type of pink eye resolves on its own, but it’s also contagious. Dust, mold, and pet hair/dander can all cause allergic reactions, which may then result in eye inflammation. This type of pink eye can recur until you remove the source of the allergen. Often, doctors will specifically refer to viral infections as pink eye, and use the term conjunctivitis for both the inflammation caused by allergies or bacteria. Bacterial pink eye is more likely to have a discharge, which can sometimes be severe enough to cause the eyelids to stick together. Allergic conjunctivitis may occur with other allergic symptoms, such as runny nose, itchy skin, and sneezing. How long does pink eye last? Well, it depends on whether you treat the condition or not. While most types of pink eye will eventually go away on their own, you may not want to wait through the discomfort and irritation. As well, some types of pink eye, such as bacterial or allergic, may not go away on their own without pink eye treatment. It’s always a good idea to see a doctor if you are suffering from pink eye. However, depending on the type of inflammation you have, your doctor may not be able to prescribe you any effective treatments for pink eye. Luckily, there are a number of home remedies for pink eye that can be effective. These natural remedies for pink eye include honey, apple cider vinegar, salt water, milk, and herbal tea compresses. Honey may taste good, but it’s gaining more attention nowadays for its healing properties than for its flavor. Honey is an antibacterial and antimicrobial, meaning that it can be effective for fighting both bacterial and fungal infections. Honey also has anti-inflammatory properties, making a great superfood for combatting inflammation. Studies have actually confirmed that honey can be used to treat bacterial infections, including some forms of pink eye. 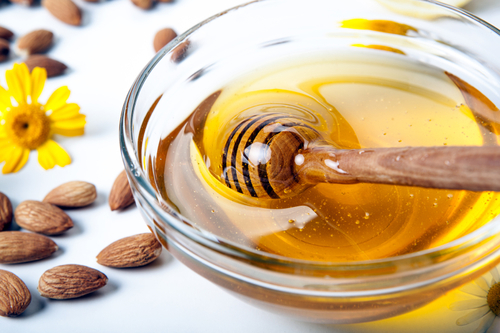 Honey was also used by ancient Egyptians and Greek to treat their eye infections. To harness the healing powers of honey, mix a quarter-teaspoon of honey with a quarter-cup of warm water. The water should be distilled or filtered, or you can use spring water. Using an eyedropper, you can apply two drops of the mix into your eye every few hours. It’s important to use raw, organic honey, as processed honey may not have the benefits. Pink eye home remedies with apple cider vinegar can be quite effective. Instead of applying honey to your inflamed eye, apple cider vinegar can bring many of the same benefits. It is antiviral, antibacterial, and antifungal. You can mix one tablespoon of apple cider vinegar with one cup of warm water, and use this mixture as an eye rinse. While this can be effective, it can also sting a little. If you want to avoid any stinging sensations, simply dab some apple cider vinegar on your eyelids and the surrounding tissue. There are also pink eye home remedies with salt water. Salt water rinses are effective at eliminating bacteria, as well as easing inflammation from allergic reactions. While you can purchase saline eye drops, you can easily make your own solution at home. Boil one cup of water with half a teaspoon of salt, and then use the solution in an eyedropper or an eye cup. The salt water solution will help clear up redness, inflammation, and itchiness. Herbal tea compresses are another good home remedy for pink eye—green tea and chamomile are both effective for easing inflammation. For pink eye home remedies with tea bags, soak the tea bag in warm water for several minutes, then hold down over the affected eye for up to five minutes. Milk can also be used for treating pink eye. However, regular cow’s milk does not contain the potent probiotics and other nutrients that are essential for treatment. Instead, breast milk is the most effective option for treating pink eye. Apply some breast milk to the eye three times a day, making sure to lift the eyelid to allow the milk to circulate. Raw cow’s milk or raw goat’s milk can also be used as a substitute. What is the Incubation Period of Pink Eye? How do you prevent pink eye? Usually, you can only treat it once it occurs. By the time you notice the first symptoms of pink eye, the infection has usually been incubating for some period already. Bacterial pink eye usually has an incubation period from one to three days. For viral pink eye, it can take up to three days for incubation, but also as little as 12 hours. Allergic pink eye occurs based on your exposure to allergens. Is Pink Eye Contagious? Is it Contagious during the Incubation Period? Pink eye is often contagious. With viral pink eye, the infection can be easily spread to other people just as a cold or flu. Sneezing and coughing can lead to other people contracting the virus. With bacterial pink eye, the infection is spread through physical contact. For instance, if you rub your eyes and then touch someone else’s glasses, it’s possible to spread the infection. You also have to be very careful about sharing bed linen, towels, and cloths. However, pink eye is only contagious once symptoms have appeared; during the incubation period, you cannot spread pink eye. This is good, because it means that once pink eye does appear, you can take steps to ensure that it doesn’t spread to your family, friends, or co-workers. How Long Does it Take for Pink Eye to Go Away? Pink eye can go away in as little as a few days, or it can last as long as a few weeks. The recovery time varies depending on what type of pink eye you have. Typically, symptoms are at their worst three to five days after the onset of the infection, and then you enter the recovery stage, slowly improving for days or weeks. Using the right home remedies for pink eye can help speed up the recovery process. With allergic conjunctivitis, pink eye can keep occurring as long as your allergy triggers are present, so it’s important to find the right treatments for the specific form of pink eye. What are the Risk Factors and Complications of Pink Eye? Touching your eyes with unwashed hands. Once you have pink eye, you can usually expect it to resolve on its own. However there are complications that may arise if you do not get treatment, particularly with bacterial pink eye, such as vision problems and severe infections. How Can Pink Eye Be Prevented? Do not rub your eyes or touch your eyeballs, especially with unwashed hands. On that note, wash your hands frequently. Frequently wash towels, bed linens, face cloths, pillowcases, and other fabrics that touch your face. Do not share towels or cosmetics. Do not swim in public swimming pools. Throw out any cosmetics you have used recently. Again, wash all of your towels, pillowcases, and bed linens. Use the full course of any antibiotics prescribed to you by a physician. When you have pink eye, there are some simple lifestyle changes you can make to ease your symptoms, improve recovery, and avoid spreading the infection. Contact lenses can be a problem when you have pink eye. They can irritate the condition, as well as carry bacteria that can re-infect you afterwards. You may have to throw away your lens case, cleaning solution, or disposable lenses if they have been infected. If you have non-disposable lenses, then you will need to clean them thoroughly. Do ice packs help pink eye? It’s actually better to do a cold compress. Doing warm or cold compresses on your affected eye will help ease some of the symptoms and irritation. You can use a clean, damp cloth for these compresses. They do not cure pink eye, but they may help you manage the condition better. There are over-the-counter eye drops available that can help reduce itchiness, swelling, and red eyes. These eye drops are particularly effective for allergic conjunctivitis, as many contain antihistamines that help reduce allergic symptoms. Pink eye can be annoying and irritating, but there’s no reason to suffer through the eye infection without any treatment. There are a variety of natural home treatments you can use to help speed up recovery and put an end to pink eye. By taking steps to avoid spreading the infection, you can keep your friends and family safe, and say good-bye to your annoying pink eye!